Edible Oils: How Are They Used? Edible oils are most often plant-based oils, which are similar, if not the same as those produced by the industrial biotech industry for use as biofuels such as biodiesel, for use in cosmetics, and in other everyday biotech products. Edible oils may be solid or liquid at room temperature. Edible oils are defined by the Government of Ontario, Canada as "a food substance, other than a dairy product, of whatever origin, source or composition that is manufactured for human consumption wholly or in part from a fat or oil other than that of milk." The US FDA does not provide a definition for edible oils on their website. Plant-derived edible oils consist of carboxylic acids with long hydrocarbon chains, in contrast to petroleum-based oils which lack the carboxyl group on the end. The carboxyl group makes the oils edible, providing a site for our enzymes to attack and break down the chain in a process called beta-oxidation. The lengths of the hydrocarbon chains and whether they are saturated or not, or unsaturated in a cis or trans conformation, determines how easily they are metabolized and how healthy or unhealthy they are as part of our diet. Edible oils are, of course, differentiated from inedible oils such as petroleum-based products (gasoline, fuel oil, and related products). Various forms of grease and lubricant may also be considered inedible oils. There are, also, a number of plant-based oils that are inedible for humans--but are very useful for other purposes (primarily as biofuels). These include (among others) jatropha, Karanja, mahua, linseed, rubber seed, cottonseed and neem oils. While there are dozens of edible oils available, a handful makes up a very large percentage of the world's edible oil production. 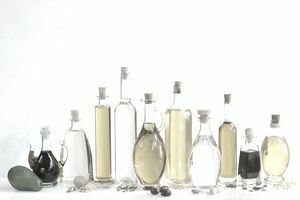 All of these oils can be used in cooking, but are also used as biofuel. Saturated oils are solid at room temperature; this describes shortenings, margarine, and a few other commonly eaten oils. Monounsaturated oils are liquid at room temperature but begin to solidify in the refrigerator. These include olive oil and peanut oil. Polyunsaturated oils remain liquid when at room temperature or when chilled. These include canola, sunflower, and walnut oils (among others). Saturated oils are considered to be relatively unhealthy because they can contribute to higher cholesterol levels and heart disease. Thus, monounsaturated and polyunsaturated oils are usually a better choice for overall health. Grapeseed oil is high in vitamin C.